One of my favorite things to do when I travel is to not only discover unique brands found in each country but also visit local makeup artist schools to learn about new techniques and find out what it’s really like to work in beauty around the world. Every country has its own style, and also clientele. Concerns of women change from the country not only in rights but also in beauty. The idea of beauty in one culture is completely opposite to another. Everyone is battling a different issue for some its hot weather, hyper-pigmentation where across the world its more about wrinkles, and aging. 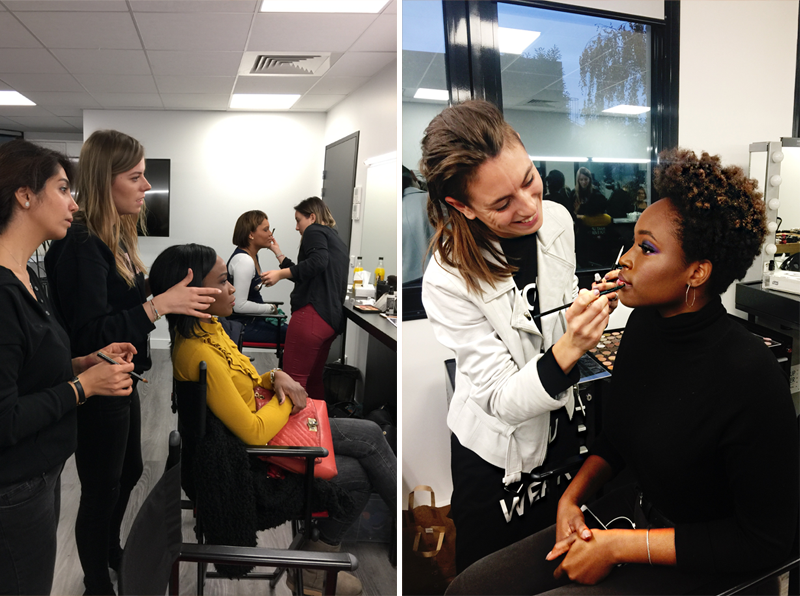 On this trip, I was #Beautyexploring Paris and no better place to start then MAKE UP FOREVER ACADEMY. A staple among the beauty industry and led by one of the most iconic artists of our time Dany Sanz. 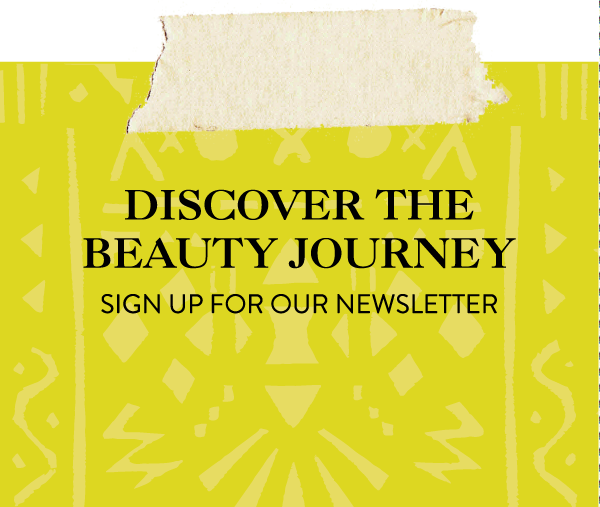 You didn’t have you ask me twice when I saw an opening for their Beauty Basics #2 week long course to sign up. Perfect for artists wanting to brush up on their techniques and for me to learn what really was so different about French beauty. French women are known for minimalist makeup, effortlessly chic style and aging secrets of beauties like Catherine Deneuve. Call me bias, but I had the honor of assisting Brigitte Reiss Anderson, Makeup artist Icon who just had this way of being ( you can say French) but just this elegance to her that was something I didn’t know about or understand. I just knew I wanted to be more ( cough cough French) effortless. I still remember Brigitte having me do some makeup research by watching ” Bella De Jour” a French film with Catherine Devenue. She was the symbol of beauty and until this day its one of my favorite movies that introduced me to French beauty. Her winged eye-liner, the pointed nose just painted a picture of the classic french. Effortlessly chic, and sophisticated. The term Parisienne describes them and MAKE UP FOREVER ACADEMY was my way in. TOP 3 Beauty Secrets I discovered….. 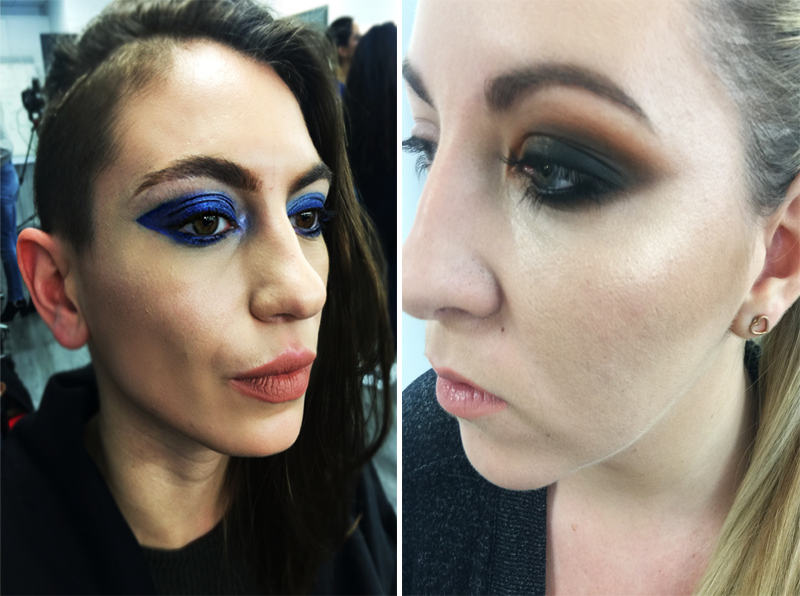 Creating a smokey eye is a staple in our industry but what I learned was to focus on three colors. A smokey is all about fading the closer as it gets to the brow. Everyone’s eye is different so adapt it to each shape. What I loved was that we broke down each eye shape and really understood the foundation to how to make each eye pop for the camera. The halo technique is also a way to add drama to the eye and it’s all about using color for the intensity of the look. You want the base color thats a neutral, mid-color which is the one that marries the light to dark and of course the darker shade that creates the depth. Color-correcting. Yes, I had heard about color correcting before but my work has been inspired by the Billy B, Kristopher Buckle, Renny Vasquez, Scott Barnes who are all about erasing and building up. Seeing it first hand really changed everything. I saw the difference it instantly made. If your suffering from dull skin add a little yellow base to pop the complexion. Dark under eye discoloration? try a red/orange corrector. It gives you an instant eye-lift reducing puffiness and darkness. As mentioned I came here to get outside my comfort zone so I picked up the MUFE color correctors and played until I got it right. BTW ordering Terry Tomlinson flesh tone color wheel chart as soon as I get back to the states. Foundation Base Matters. What does that mean? In my style of doing makeup ( I work on-camera mostly), I’m obsessed with RCMA, and makeup that really has intense coverage. 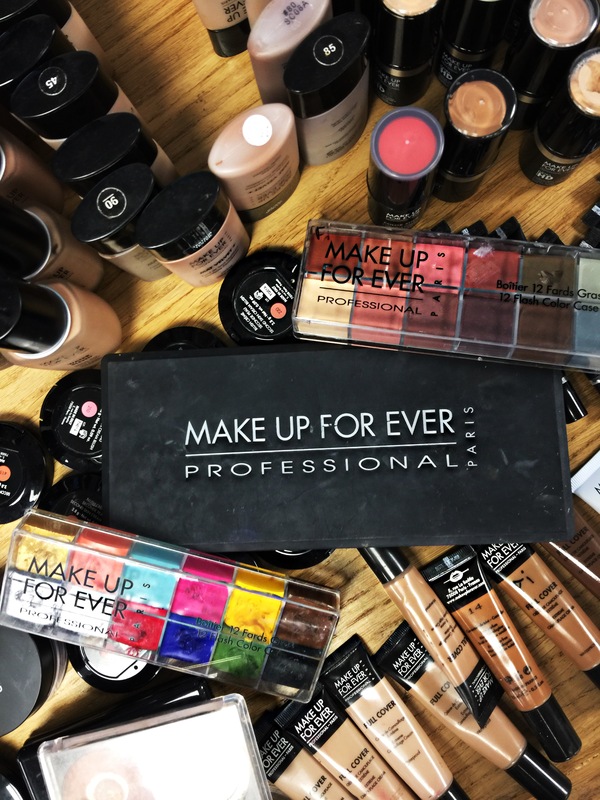 Learning about all the incredible foundation’s at MAKEUP FOREVER has made revaluate how to use light-weight, water-based to HD foundations for when working backstage. MAKEUP FOREVER really take the guessing work out of making makeup look its best and last longer. Less is more. A little eyeliner flick just at the corner of the eye lifts and darkens the lash line making it appear bigger. Voila..
Skincare is essential. France is known to be the highest of standards for beauty. Wondering what to buy and where? Check out our previous article on beauty stops in Paris. French say skincare is the foundation of any makeup look. Nuxe oils are popular and Embryolisse face cream is a staple in the makeup artist community. French ingredients? Of course the grapes. This is the home of Caudalie. Fragrance. It’s not so much about what a woman wears on her face but more about the smell for when she arrives. France is the fragrance capital of the world. A scent is something that leaves a footprint on the mind, opens the imagination and when done right enters the room before your arrival and lingers once you depart. It speaks without force. Special thank you for Sophie who took me on a walking perfume tour in Paris. But by far my favorite experience of spending a week at MAKE UP FOREVER ACADEMY was meeting global makeup artists. Who knew that taking a makeup course would of led me to make such good friends from all over the world. We had an international group of makeup artists that had salons, Youtube channels, respected working artists from Iran, Iraq, Norway, Chile and of course France. They were also here to take the course for the same reason. To learn more, be better, and be inspired by the magic of France. My one week at MAKE UP FOREVER ACADEMY will be one I’ll never forget not only for the incredible techniques I learned but also for pushing me outside my comfort zone to try a new way of seeing beauty and applying it to my work. A special thank you for MAKEUP FOREVER and my awesome teacher Magdalena Ficon ( IG @magdalenaficon) for showing me her style, and beauty. I definitely have to add Paris to my travel bucket list! It sounds absolutely beautiful! I love your writing style. I can picture Paris and color theory through your writing!